− 5 = three Required Please enter the correct value. Sept. 16 update: The Eurozone inflation rate is slipping despite the best efforts of the European Central Bank to increase it. Eurozone inflation declined to 0.1% from 0.2% in August, according to the European Union's statistical office. Previous estimates had said the inflation rate would remain flat. 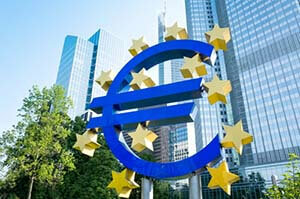 The European Central Bank (ECB) is loath to admit it, but it has no control over the Eurozone inflation rate. According to the Eurostat flash estimate released this morning (Monday), Eurozone inflation in August was unchanged at 0.2%. That's far below the 2% inflation rate target sought by the ECB. And it shows just how ineffective the central bank's unprecedented monetary stimulus program has been. The ECB is in the middle of a €1.1 trillion ($1.2 trillion) quantitative easing program, similar to the three rounds of QE programs implemented by the U.S. Federal Reserve from 2008 to 2014. The ECB has been buying €60 billion worth of bonds each month since March in a desperate attempt to drive Eurozone inflation higher. The QE program is expected to last at least until September 2016. There's little evidence that QE has worked anywhere it has been tried, other than to artificially boost stock prices and inflate asset bubbles. In the case of the ECB, not only has it failed to raise the Eurozone inflation rate, its forecasts have been consistently wrong. Despite evidence to the contrary, ECB Vice President Vitor Constancio expressed optimism that the central bank will get the Eurozone inflation rate to rise to the desired targets in a paper delivered at the Fed's Jackson Hole retreat this past weekend. "Provided our policies are able to significantly reduce the output gap, we can rely on a material effect to help bring the inflation rate closer to target," Constancio said. But outside experts disagree. In fact, when the ECB does finally admit that its QE program is not succeeding in raising Eurozone inflation enough, the odds are it will do even more bond-buying. I despair of the idiots that run the central banks, not only do they not understand how the operations work for currency issuers but they somehow they deduce that the millions of persons they condemn to absolute poverty (with the gracious assent of governments of course) will jump to push prices up with money that they have not, and could not have because it is not created to them. If the government does not spend to the economy via the central banks then we do not have money to spend because they have NOT CREATED IT FOR US TO SPEND. Quantitative easing will have zero impact on inflation as is surely obvious by now.